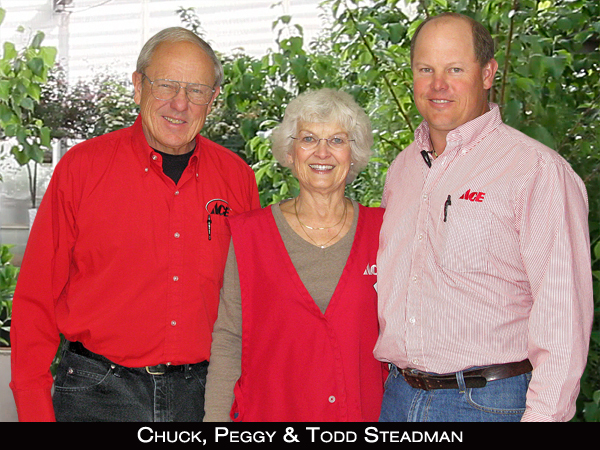 Chuck & Peggy Steadman began the ACE hardware store in downtown Miles City in 1967. In 2001 the store moved, for the 4th time, into their current 50,000 square foot facility. Today the store is operated by son Todd, alongside Chuck and Peggy, making it a true, family run business. Aside from a complete complement of Lawn and Garden, hardware, tools, paints, electrical and plumbing supplies, the newly remodeled facility offers brand name major appliances, a Radio Shack®, PJ’s Candies, gourmet housewares, ACE Rental Place, a greenhouse, pet supplies, farm & ranch supplies and much more. Steadman’s ACE Hardware is a regional store serving customers in Montana, Wyoming, South Dakota and North Dakota.